Meigs senior Madison Fields (2) sets the ball to teammate Marissa Noble (left), in front of GAHS senior Ashton Webb (11) and Blue Angels head coach Janice Rosier, during Gallia Academy’s straight games win on Sept. 18 in Centenary, Ohio. 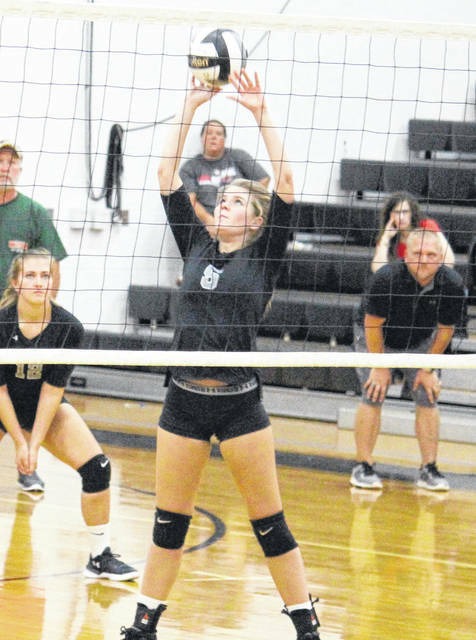 River Valley senior Rachel Horner (5) sets the ball, during the Lady Raiders’ non-conference match against Belpre, on Sept. 10 in Bidwell, Ohio. 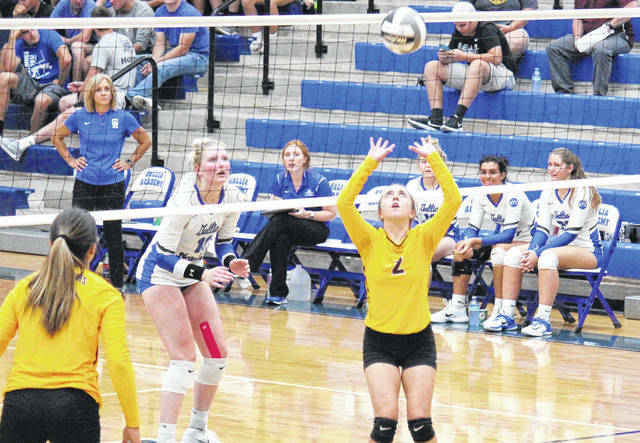 A total of 12 people — 11 players and one coach — were named to the Division II and Division III All-District 13 volleyball teams, as selected by the coaches within the district. Gallia Academy, a district semifinalist, finished with a 21-4 record and had six representatives on the Division II list, which featured a quartet of Lady Raiders, who finished the year with a 10-13 record. Meigs picked up a pair of selections on the Division III all-district team after a 4-17 campaign. GAHS head coach Janice Rosier — who now has a career record of 108-15 in five seasons with the Blue Angels — was named Division II Coach of the Year for the third consecutive season. Gallia Academy senior Ashton Webb is the Division II all-state representative, and is the Offensive Player of the Year for a second straight season. This is the third consecutive year Webb is on the first team, after an all-district honorable mention nod as a freshman. GAHS juniors Peri Martin and Alex Barnes join Webb on the first team, both doing so for a second straight season. Gallia Academy senior libero Taylor Burnette was named to the Division II second team, her second career all-district honor, after landing on the Division IV honorable mention list as a sophomore at South Gallia. GAHS senior Hunter Copley also earned her second all-district nod, being selected as an honorable mention, after being on second team a year ago. Senior Rachel Horner is the lone repeat selection for the Lady Raiders, being named to the second team, after landing on the honorable mention portion of the list last fall. Horner is joined on the second team by sophomore teammate Mikenzi Pope. RVHS senior Kelsey Brown and junior Lora Kinney were both honorable mentions on the Division II team. In Division III the Lady Marauders were represented on the second team by Madison Fields, who was an honorable mention last season. MHS senior Marissa Noble was an honorable mention for the Maroon and Gold this fall. Note: The Division IV All-District 13 teams, featuring Eastern, South Gallia and Southern, will be available in Thursday print editions of The Daily Sentinel and Gallipolis Daily Tribune. Ashton Webb, Gallia Academy, Diamond Decker, Warren; Cameron Zinn, Vinton County; Victoria Lewis, Warren; Alex Barnes, Gallia Academy; Sarah Webb, Athens; Abbey Munn, Jackson; Peri Martin, Gallia Academy; Abby Gilliand, Warren. Offensive Player of the Year: Ashton Webb, Gallia Academy. Defensive Player of the Year: Diamond Decker, Warren. District 13 State Representative: Ashton Webb, Gallia Academy. Coach of the Year: Janice Rosier, Gallia Academy. Mikenzi Pope, River Valley; Lacy Ward, Vinton County; Grace Reed, Athens; Gracie Walburn, Jackson; Ava Myers, Athens; Taylor Burnette, Gallia Academy; Rachel Horner, River Valley; Emma Stroth, Jackson; Maylea Huff, Vinton County. Kelsey Brown, River Valley; Lora Kinney, River Valley; Kaylee Stewart, Athens; Madison Foy, Warren; Kaylee Ullman, Warren; Reaghann Folden, Jackson; Kerrigan Ward, Vinton County; Sydney Smith, Vinton County; Hunter Copley, Gallia Academy. Kelsie Warnock, Fairland; Rachel Wheeler, South Point; Kyla Henderson, Nelsonville-York; Mallory Rankin, Alexander; Jadyn Mace, Alexander; Allie Marshall, Fairland; Sydney Mullins, Wellston; Samantha LaFon, Ironton. Co-Offensive Players of the Year: Karli Davis, Chesapeake; Karsyn Raines, Alexander. Defensive Player of the Year: Sarah Allen, South Point. District 13 State Representative: Karli Davis, Chesapeake. Coach of the Year: Nikki Ohms, Alexander. Coaching Achievement award: Mike Swarts, South Point. Taylor Reynolds, Coal Grove; Riley Schreck, Ironton; Sami Stamper, Rock Hill; Audrey Bohyer, Nelsonville-York; Corinne Ferguson, Chesapeake; Madison Fields, Meigs; Holly Ramey, South Point; Tressa Lambert, Wellston. Jenna Houpt, Alexander; Erin Scurlock, Alexander; Marybeth Burton, Ironton; Lydia Hannan, Ironton; Peighton Rowe, Ironton; Bailey Roland, Fairland; Taylor Webb, Fairland; McKenzie Harris, South Point; Brooke Bowen, South Point; Addi Dillow, Coal Grove; Mattie Malone, Coal Grove; Kayleigh Murphy, Coal Grove; Madi Campbell, Nelsonville-York; Grace Sinnott, Nelsonville-York; Ally Neal, Rock Hill; Katie Arthur, Rock Hill; Whitney Howard, Rock Hill; Kelli Aubrey, Wellston; Marissa Noble, Meigs; Chloe Handley, Chesapeake.